What does it take to run a company, raise three kids, and still keep it all together? In this interview with Sabrina Parsons, CEO of Palo Alto Software, we’ll get answers to these questions and a good deal more. Sabrina talks about her philosophies surrounding an “integrated life” versus trying to achieve the elusive “work-life balance,” and some of the tools she uses to both organize her personal life as well as make her work life more streamlined. Do you think it is important to make time to be “off the grid” and do you regularly try to schedule time to be completely “off”? That’s a really hard thing to do. I haven’t scheduled any “off time” in a long time. Noah—my husband and the COO of Palo Alto Software—and I talk about doing it by going somewhere where there is no internet, in essence forcing us “off the grid.” When you run a company, the company feels almost like another child. It feels like you can’t abandon it, and that you always have to be available. Obviously, you should be able to get away for a week. We have great people on board, and we know they can manage it. Do you draw a hard line between work time and personal time? I don’t. It’s something that I feel is a very personal decision for people. Some people never want to talk about work at home, or do work at home. I feel like I can’t have a hard line between work and personal time because of the nature of being a mother and a CEO. I need to be able to flow in and out. I need the flexibility to be a mom, and then jump back into work. I call it “integrated life.” I prefer approaching my life without drawing hard lines because it feels more real and doable. The idea of a balanced life stresses me out. Balance implies that the more you put on the work scale, the more you have to put on the personal scale. That approach seems very overwhelming. I just embrace who I am—mother, wife, career woman—and don’t try and draw hard lines between those personas. Blurred lines work for me. Blurring lines allows me to work hard and still be present for my kids. If I can talk through business issues with Noah when we drive over the mountains every weekend in the winter to take our kids skiing, then my Friday feels very productive and optimized. We schedule our weekly debrief every Friday night from 6pm to 8:30pm while we drive. Mixing work and personal life means we can leave work at 5pm, and pack the car up without feeling like we’ve cut our day short. We debrief, deal with any issues that have come up throughout the week, and reach our cabin ready to relax and have a great weekend with our kids. There are a lot of studies that show how important sleep is for productivity and innovation. Between working hard and raising three very active boys, do you actually get to sleep? I do know sleep is important and if I don’t get enough, it’s really hard to be productive, and even to think straight. My day doesn’t end when I go home from work. Because my three kids lead active lifestyles, there are many different places I need to be every day of the week. The kids are on the swim team, they go to extra math and French classes, they have lacrosse practice, track, guitar, piano…I leave here and I feel like a glorified taxi service. There’s a lot going on. If I don’t get sleep, it’s exhausting and I turn into a wreck. I try to get to sleep every night by 10pm, and be disciplined about finding time to work out during the day. If I get regular sleep and work out, I feel my brain works better, and my body feels better. I think that while it’s hard to manage all the commitments in my life, if I don’t take care of myself—sleep well, eat right, and find time to exercise—then I can’t be as productive and focused as I need to be. Being exhausted, overtired, and unhealthy will not serve me, my family, or Palo Alto Software well, in the long run. I make better decisions, am able to better assess appropriate risk, and am more passionate when I take care of myself. As you juggle everything you have going on in your life, you must think about what makes it all worthwhile. What’s your definition of success? Ultimately, I want to be personally happy. I think that has always been my definition of success. 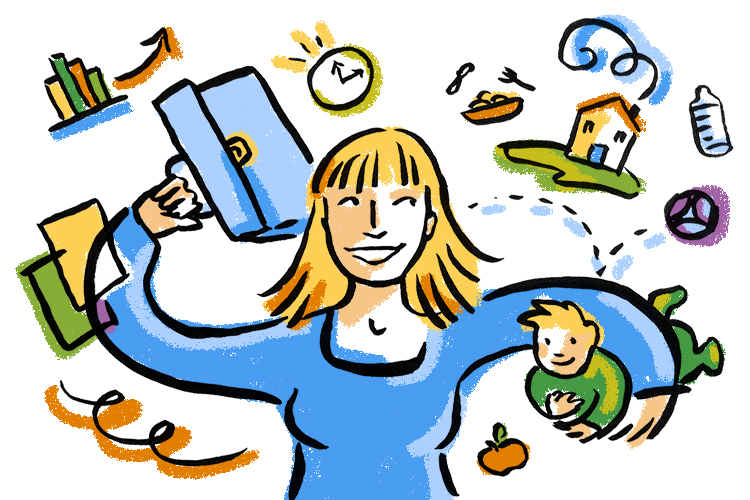 I’m a mom, I’m a wife, and I’m a very motivated career person. And each one of those parts of my life is important and brings me joy. I want to live life to its fullest and do fun, adventurous things. I want to have a work life that allows me to do that, and I want work to be part of my passion and excitement. I want to feel like I can take risks, and use my brain. I want to be a really good mom. That’s really my definition of success. Within the context of mom, wife, and CEO, I also want to be a good citizen. I want to feel like I run a company that people want to work at and are happy to be at. I run a for-profit company; I want it to grow—I’m competitive. I want it to get better and bigger, but within the caveats of our business values: serving the customer, being fair, being honest, and providing a really high-quality product for a fair price. Doing something I believe in helps focus my attention in the right places, and makes me happy to be at work. We’ve talked about work-life balance, how you juggle your kids and the company, and how you define success. Now let’s get down to brass tacks. Are their tips and tricks you use to organize yourself and help you in your job? I cannot live without Google Calendar. We use it here at Palo Alto Software. I have my work schedule, I can see all of Noah’s work schedule, and then we share a calendar we call “Kids and Home.” If it’s not on the calendar, it’s not going to happen because between work and meetings for volunteer organizations and kids, it’s a very careful dance. At Palo Alto Software we have a lot of great SaaS tools we use to keep everyone on track, and working toward the same goals. Because my passion lies in helping people succeed in business, I truly believe that organization and good management are the cornerstones of a great business. HubSpot with Sidekick: A great CRM tool to track our leads and make sure we serve our customers as well as possible. Sidekick is a great add-on that makes our strategic sales and business development teams more productive. It also makes it easier to make sure we can all collaborate and help each other. Basecamp: We use Basecamp to keep all of our projects on track and to help teams work together without having to flood everyone’s email with communications. You can create projects, deadlines, tasks, to-do items, and files associated with every project. Google Drive and Google Docs: We never email files to each other. Instead, we use Google Docs and Google Drive and as a consequence have eliminated the issues with emailing attachments that are not up to date or the right version. Using Google Docs allows us to track changes and have version control so that we can optimize communication and collaboration as a company.